Sometimes a ditty bag is exactly what a customer who plays golf needs. Your next convention's swag table will benefit from promotional ditty bags that brag about your goods and services. And printed tee pouches are always great for giving out to clients and prospects who enjoy a game on the green. We've got options for every one of those situations, and all fully customizable with your company's branding and logo. The 8” x 6” Ditty Bag With Pocket features carabiner attachment system and allows printing custom details for impressive Company Logo Products. The Clip On Valuables Case features ample space to store valuables and accessories and allows printing custom details for Brand Recognition. 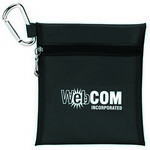 Our Large Tee Pouch features metal carabiner for easy clipping on golf bags and allows customization to create impressive Promotional Logo’d Products. 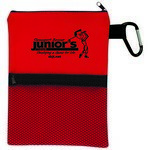 The Mini Golf Bag makes a unique choice for a promotional giveaway and allows complete customization with brand logo and message. Our Montana Event Kit features a versatile pouch that serves multiple applications and allows adding brand logo and message to create amazing Promotional Gifts. 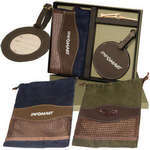 The Montana Event Kit features versatile pouch that allows storing any item and makes an interesting option for Custom Giveaways with your brand logo. Our Montana Tee Pouch features zipper closure for safe and secure storage and makes an interesting option for Business Giveaways, customizable with brand logo. Our Neoprene Ditty Bag with Carabiner features zipper closure and offers customization ability for Brand Recognition. 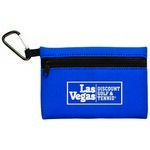 Our Tees-N-Things Pouch features a metal carabiner for easy clipping on golf bags and allows adding custom logo to create impressive Business Giveaways. Our Valuables Zippered Pouch features zippered closure and allows adding custom logo for creating impressive Business Giveaways. Our Vertical Strap Tee Pouch features metal carabiner clip and allows adding custom logo for impressive Company Logo Products! This one is simply made for your customers who fall into the High Net worth Individuals bracket. With your logo neatly imprinted on this Woodbury ™ Golf Pouch and Round Golf Tag Set, your brand recall is always ensured thus giving a great impetus to your business.